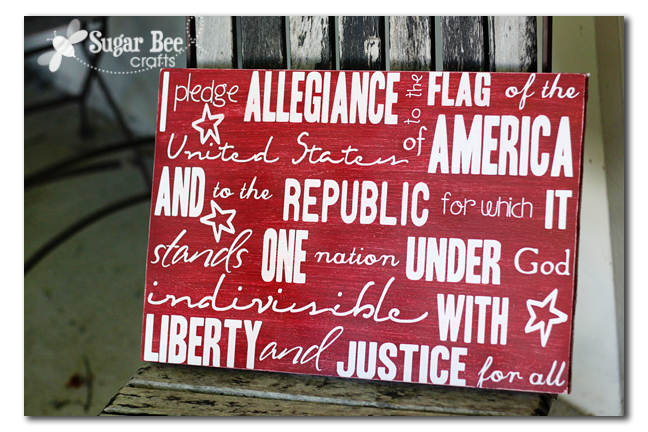 For all those who need some decor for 4th of July, check out this Pledge Allegiance Sign I just whipped up – – and I have a quick tutorial for ya! First off, a few weeks ago we went to a swearing in ceremony for new citizens. It was really powerful and I think everyone should attend one at least once in their life. So glad we got to go and I thought it was a great thing for our kids to experience. A few days after we got back, I saw this post on Poppies at Play – – and with our recent experience, I knew we just NEEDED it! I loved the design of the Pledge of Allegiance and I knew if I tried to make something similar, it just wouldn’t turn out – so I purchased the vinyl from them and it was sent to my home super quick. 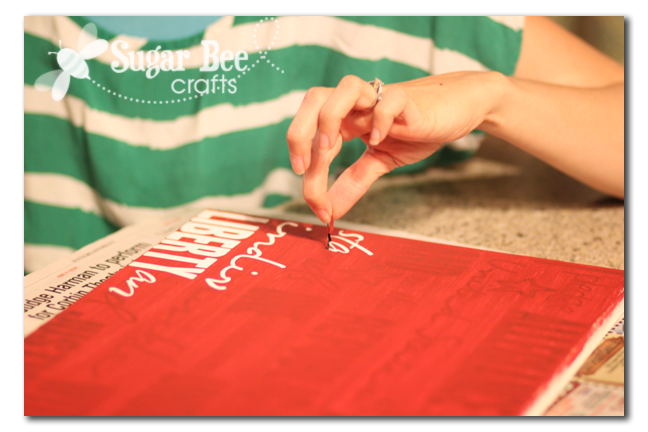 Now, I’ve mentioned this before on my post about how to leave stained letters (see it HERE) – – the secret to crisp lines when painting over vinyl – – MOD PODGE!!! Because – – when you paint over vinyl, some of it inevitably seeps under the vinyl . 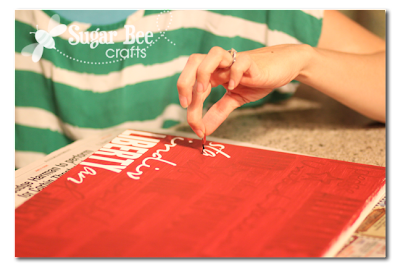 So when you paint on a layer of Mod Podge, IT is seeping under your vinyl. But it’s clear. And it seals the seeping point. 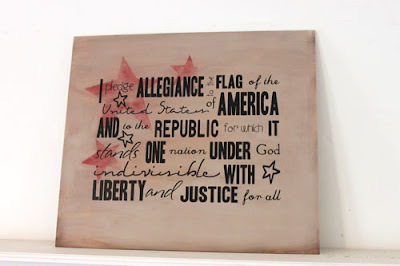 So paint on a layer of Mod Podge and let dry. THEN paint on your color. Let that dry. If you have never tried the Mod Podge trick, I highly recommend it!! Go give it a try! 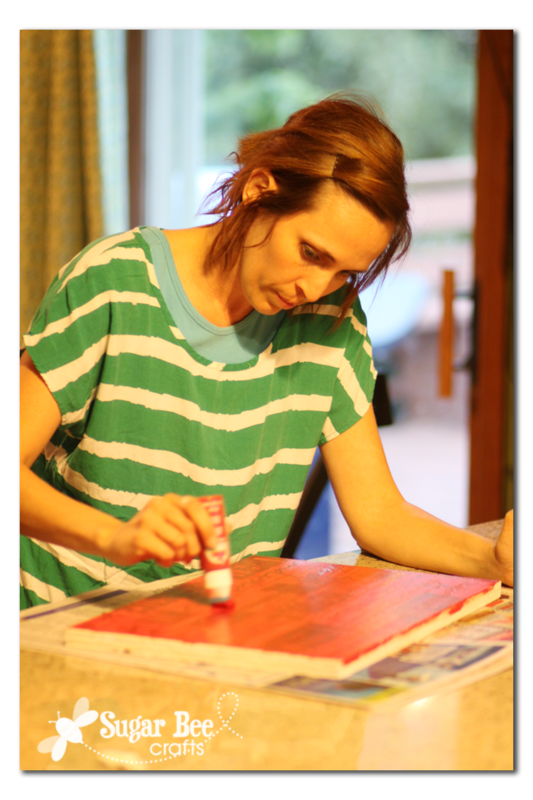 You can pretty much rule the world with modpodge and duct tape. Awesome tip!! Wonderful sign ( and I agree with you about attending a swearing in ceremony…it’s pretty amazing) and thanks for the tip on the Mod Podge! Great, great, great! Thanks a lot! When I can, I must try it! Sweet! 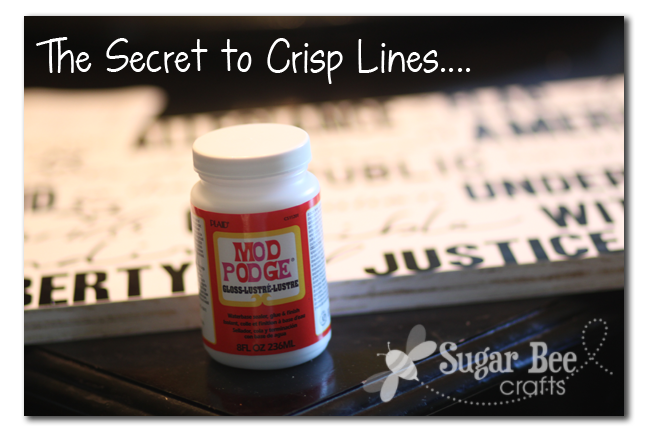 Thanks for the Mod Podge tip!!! I saw that comment over on the hubs’ blog… too funny! Beautiful! Thanks for the neat mod podge trick too. This is really neat! Thanks for sharingteh awesome tip! That is so cool. I am making one myself. Did the lines in the red paint come from a special paint you used? If so what red paint did you use. This is such an awesome tip! I’m so using it! Thanks for the tip! I wonder, if you didn’t have Mod Podge on hand, if painting over the vinyl in your background color and then your top color would have the same effect. 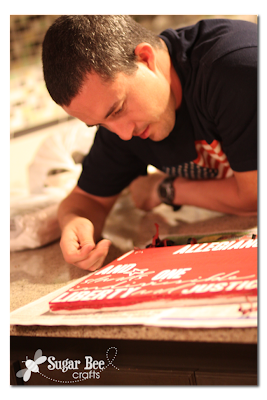 i.e., the white would ‘bleed’ under the vinyl, and not the red. I have used the base paint method, but hadn’t heard of the modge podge. What will happen if you try and distress it? I tried this after reading your blog..it worked like magic! thank you so much for the tip!! First time reading your blog and I love it! What a great job! I love the step by step tutorial. Where did you get all the fonts? I have a Cricut but just ordered a Cameo and can’t wait. Thanks for your inspiration!! I love this tip! 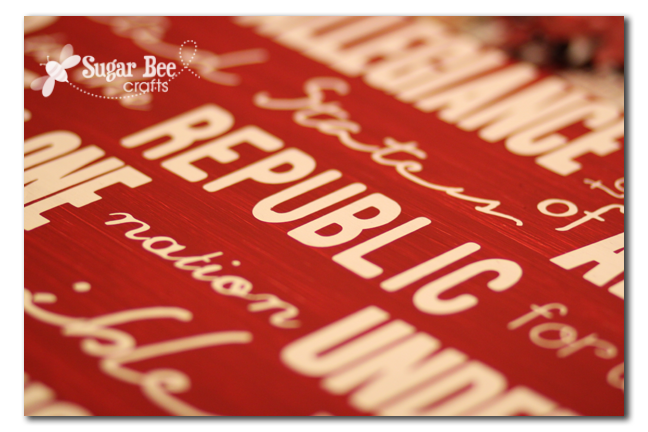 I have another question…I like to varnish old barn boards and then use vinyl stencils to write quotes on them. But I like to keep the varnished board look and so I do the stencils the opposite way where I fill in the stencil with paint…do you have any recommendations on how to not let it bleed thru that way? 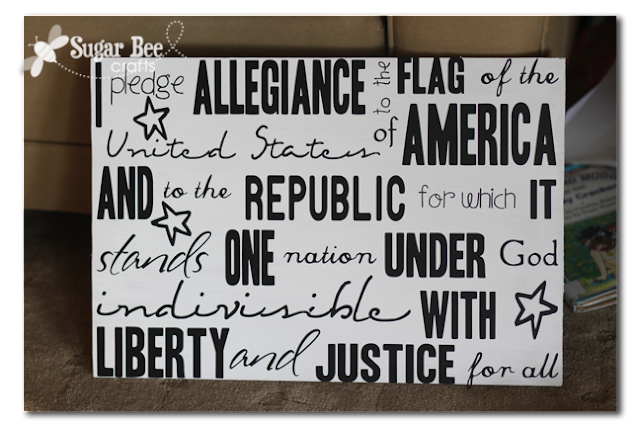 I love this, thank you..I’ve been looking for a way to make a sign appear hand painted, using vinyl letters, but I was worried about seepage!!! Thanks so much for the tip!!! Great! Excited to try this! Have a question , is the vinyl reusable? WOuld you consider posting a video blog on how to do this? Those are great for us visual learners~ Thank you!! :)Judi Army Wife~stationed at Fort Leavenworth! it would be hard to reuse the vinyl, but probably not impossible. Video tutorials are for sure on my to-do!! Where did you purchase the vinyl letters? I got them from the Poppies at Play site – thanks! Do you just put Hodge Podge on the vinyl pieces or the whole sign? Also do you have a video tutorial up yet? all over the whole sign, being sure to cover the edges of where the vinyl meets the wood. No video yet, but thanks so much for the reminder!